These golden brown hard-shelled worms are the larvae of click beetles, and are found throughout the United States. They live in the soil where they feed on stems, roots, seeds, and tubers of a wide variety of plants, including corn, potatoes, beets, carrots, and sweet potatoes. They are seldom a serious problem, but they are most likely to appear in large numbers in garden soil that was recently covered by sod. Cultivation and crop rotation are usually all it takes to keep populations low. You can test your soil for the presence of wireworms by spearing pieces of potato on sticks and burying them 2 to 4 inches deep. Dig up the pieces after a week and inspect for wireworms feeding inside. 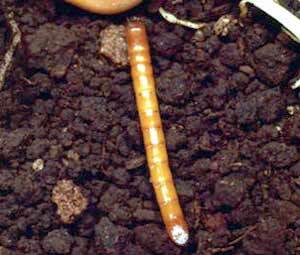 If wireworm populations are very high, use beneficial nematodes to reduce their numbers.